The following report was distributed to the households of Skerries over the last few days. Did you get yours? A text-only version is below. 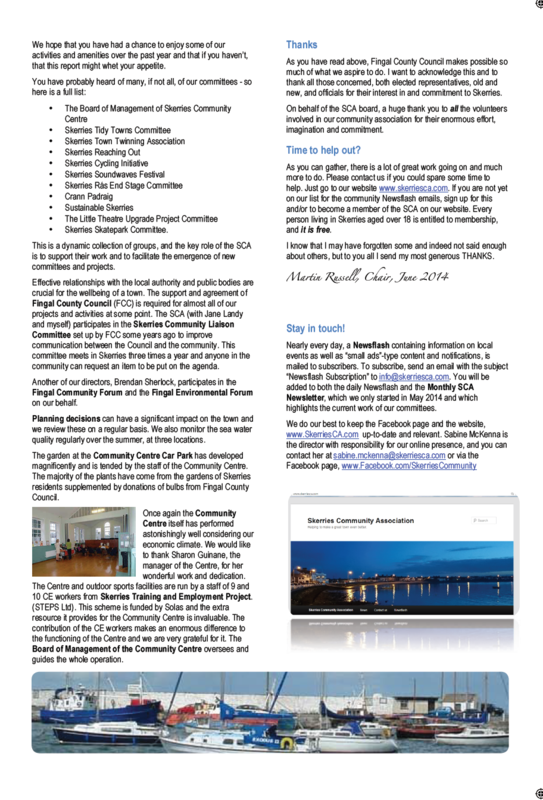 Once a year, Skerries Community Association (SCA) invites all its members to attend its Annual General Meeting. And since membership is free, and open to all over 18s who are living in Skerries (or the Skerries and Holmpatrick Electoral Area, to be precise), this is in theory every adult in Skerries! You are invited to attend our AGM for 2014, at the Little Theatre, Dublin Road on Thursday 26th June at 8pm. After the official business is finished, our annual Jim Quigley Award will be presented to the Skerries Young Volunteer of the year. Visit the Skerries Community Centre or www.skerriesca.com for procedures on election nominations and copies of our Financial Statements. 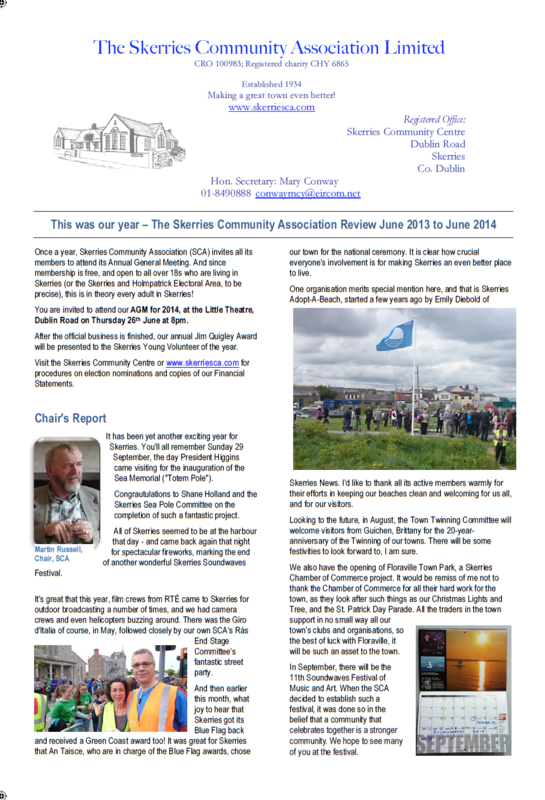 The past twelve months since my last report were yet another exciting year for Skerries. You’ll all remember Sunday 29 September, the day President Higgins came visiting for the inauguration of the Sea Memorial (“Totem Pole”). All of Skerries seemed to be at the harbour that day – and came back again that night for spectacular fireworks, marking the end of another wonderful Skerriers Soundwaves Festival. It’s great that this year, film crews from RTÉ came to Skerries for outdoor broadcasting a number of times, and we had camera crews and even helicopters buzzing around. There was the Giro d’Italia of course, in May, followed closely by our own SCA’s Rás End Stage Committee’s fantastic street party. And then earlier this month, what joy to hear that Skerries got its Blue Flag back and received a Green Coast award too! It was great for Skerries that An Taisce, who are in charge of the Blue Flag awards, chose our town for the national ceremony. It is clear how crucial everyone’s involvement is for making Skerries an even better place to live. One organisation merits special mention here, and that is Skerries Adopt-A-Beach, started a few years ago by Emily Diebold of Skerries News. I’d like to thank all its active members warmly for their efforts in keeping our beaches clean and welcoming for us all, and for our visitors. Looking to the future, in August, the Town Twinning Committee will welcome visitors from Guichen, Brittany for the 20-year-anniversary of the Twinning of our towns. There will be some festivities to look forward to, I am sure. We also have the opening of Floraville Town Park. It would be remiss of me not to thank our Skerries Chamber of Commerce for all their hard work for the town, as they look after such things as our Christmas Lights and Tree, and the St. Patrick Day Parade. All the traders in the town support in no small way all our town’s clubs and organisations, so the best of luck with Floraville, it will be such an asset to the town. In September, there will be the 11th Soundwaves Festival of Music and Art. When the SCA decided to establish such a festival, it was done so in the belief that a community that celebrates together is a stronger community. We hope to see many of you at the festival! We hope that you have had a chance to enjoy some of our activities and amenities over the past year and that if you haven’t, that this report might whet your appetite. This is a dynamic collection of groups, and the key role of the SCA is to support their work and to facilitate the emerg­ence of new committees and projects. Effective relationships with the local authority and public bodies are crucial for the wellbeing of a town. The support and agreement of Fingal County Council (FCC) is required for almost all of our projects and activities at some point. The SCA (with Jane Landy and myself) participates in the Skerries Community Liaison Committee set up by FCC some years ago to improve communication between the Council and the community. This committee meets in Skerries three times a year and anyone in the community can request an item to be put on the agenda. Another of our directors, Brendan Sherlock, participates in the Fingal Community Forum and the Fingal Environmental Forum on our behalf. Planning decisions can have a significant impact on the town and we review these on a regular basis. We also monitor the sea water quality regularly over the summer, at three locations. The garden at the Community Centre Car Park has developed magnificently and is tended by the staff of the Community Centre. The majority of the plants have come from the gardens of Skerries residents supplemented by donations of bulbs from Fingal County Council. Once again the Community Centre itself has performed astonishingly well considering our economic climate. We would like to thank Sharon Guinane, the manager of the Centre, for her wonderful work and dedication. The Centre and outdoor sports facilities are run by a staff of 9 and 10 CE workers from Skerries Training and Employment Project. (STEPS Ltd). This scheme is funded by Solas and the extra resource it provides for the Community Centre is invaluable. The contribution of the CE workers makes an enormous difference to the functioning of the Centre and we are very grateful for it. The Board of Management of the Community Centre oversees and guides the whole operation. As you have read above, Fingal County Council makes possible so much of what we aspire to do. I want to acknowledge this and to thank all those concerned, both elected representatives, old and new, and officials for their interest in and commitment to Skerries. On behalf of the SCA board, a huge thank you to all the volunteers involved in our community association for their enormous effort, imagination and commitment. As you can gather, there is a lot of great work going on and much more to do. Please contact us if you could spare some time to help. Just go to our website www.skerriesca.com. If you are not yet on our list for the community Newsflash emails, sign up for this and/or to become a member of the SCA on our website. Every person living in Skerries aged over 18 is entitled to membership, and it is free. I know that I may have forgotten some and indeed not said enough about others, but to you all I send my most generous THANKS. Nearly every day, a Newsflash containing information on local events as well as “small ads”-type content and notifications, is mailed to subscribers. To subscribe, send an email with the subject “Newsflash Subscription” to info@skerriesca.com. 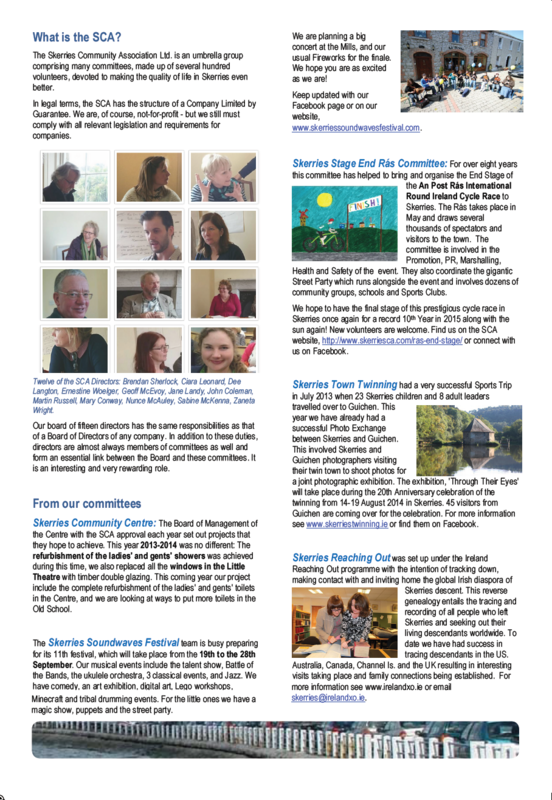 You will be added to both the daily Newsflash and the Monthly SCA Newsletter, which we only started in May 2014 and which highlights the current work of our committees. The Skerries Community Association Ltd. is an umbrella group comprising many committees, made up of several hundred volunteers, devoted to making the quality of life in Skerries even better. In legal terms, the SCA has the structure of a Company Limited by Guarantee. We are, of course, not-for-profit – but we still must comply with all relevant legislation and requirements for companies. Our board of fifteen directors has the same responsibilities as that of a Board of Directors of any company. In addition to these duties, directors are almost always members of committees as well and form an essential link between the Board and these committees. It is an interesting and very rewarding role. Skerries Community Centre:The Board of Management of the Centre with the SCA approval each year set out projects that they hope to achieve. This year 2013-2014 was no different: The refurbishment of the ladies’ and gents’ showers was achieved during this time, we also replaced all the windows in the Little Theatre with timber double glazing. This coming year our project include the complete refurbishment of the ladies’ and gents’ toilets in the Centre, and we are looking at ways to put more toilets in the Old School. The Skerries Soundwaves Festival team is busy preparing for its 11th festival, which will take place from the 19th to the 28th September. Our musical events include the talent show, Battle of the Bands, the ukulele orchestra, 3 classical events, and Jazz. We have comedy, an art exhibition, digital art, Lego workshops, Minecraft and tribal drumming events. For the little ones we have a magic show, puppets and the street party. We are planning a big concert at the Mills, and our usual Fireworks for the finale. We hope you are as excited as we are! Keep updated with our Facebook page or on our website, www.skerriessoundwavesfestival.com. Skerries Stage End Rás Committee: For over eight years this committee has helped to bring and organise the End Stage of the An Post Rás International Round Ireland Cycle Race to Skerries. The Rás takes place in May and draws several thousands of spectators and visitors to the town. The committee is involved in the Promotion, PR, Marshalling, Health and Safety of the event. They also coordinate the gigantic Street Party which runs alongside the event and involves dozens of community groups, schools and Sports Clubs. We hope to have the final stage of this prestigious cycle race in Skerries once again for a record 10th Year in 2015 along with the sun again! New volunteers are welcome. Find us on the SCA website, http://www.skerriesca.com/ras-end-stage/ or connect with us on Facebook. Skerries Town Twinning had a very successful Sports Trip in July 2013 when 23 Skerries children and 8 adult leaders travelled over to Guichen. This year we have already had a successful Photo Exchange between Skerries and Guichen. This involved Skerries and Guichen photographers visiting their twin town to shoot photos for a joint photographic exhibition. The exhibition, ‘Through Their Eyes’ will take place during the 20th Anniversary celebration of the twinning from 14-19 August 2014 in Skerries. 45 visitors from Guichen are coming over for the celebration. For more information see www.skerriestwinning.ie or find them on Facebook. Skerries Reaching Out was set up under the Ireland Reaching Out programme with the intention of tracking down, making contact with and inviting home the global Irish diaspora of Skerries descent. This reverse genealogy entails the tracing and recording of all people who left Skerries and seeking out their living descendants worldwide. To date we have had success in tracing descendants in the US. Australia, Canada, Channel Is. and the UK resulting in interesting visits taking place and family connections being established. For more information see www.irelandxo.ie or email skerries@irelandxo.ie. Crann Pádraig Skerries is an environmental group in Skerries that promotes the planting and care of broadleaf trees. The nursery at Ardla, owned by Fingal County Council, was planted, replanted, and any extracted trees were passed on to particular groups and either planted by the members to whom they were donated or in some cases by the members in Crann Padraig. The planting has been so successful that the nursery is now a small copse with some magnificent semi- mature trees. The members are always open to suggestions for further planting. Skerries Skatepark Committee is the newest SCA Committee. Following the initial meeting organised by one of the SCA directors, Nunce McAuley, the Skerries Stakepark Committee was formed under the wing of the SCA. At the Rás End Stage Street Party, they were out in force in distinctive orange-on-black Skerries Skatepark T-shirts to engage with Skerries townsfolk, collecting many hundreds of signatures and emails of those who see a real need for a skate park in Skerries. Businesses of all kinds, throughout the town, have also pledged support to a skatepark. Possible designs that would work sensitively with and enhance our unique and very special coastal environs in Skerries are currently being researched. The members of The Little Theatre Upgrade Project Committee are still working away at raising funds for a raked seated theatre. Our Bloom’s Day fundraiser on Saturday 14 June was a great success with costumed actors reading from Dubliners at different locations, entertaining passers-by on the streets of Skerries and serving a Bloomsday Breakfast Special in Ollie’s with all the offal and liver trimmings! Skerries Guerrilla Gardeners (SGG) continue to build on the achievements of the SCA Green Schools project. The committee works with other local voluntary groups to engender awareness of sustainability issues in Skerries schoolchildren. This is done through practical action such as helping to create an outdoor learning pavilion at Skerries Educate Together National School. The school has recently expanded significantly and the new outdoor learning pavilion will facilitate more outdoor, biodiversity centred learning. Teaching staff and the parents’ group are eager to get this moving. SGG will be working with parents over the summer to implement the project for which we have been successful in obtaining grant assistance under the Local Agenda 21 Partnership Fund. 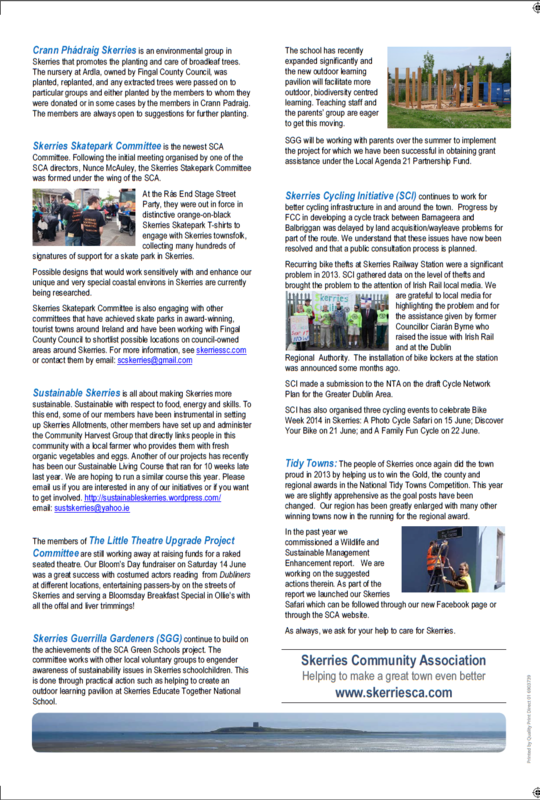 Skerries Cycling Initiative (SCI) continues to work for better cycling infrastructure in and around the town. Progress by FCC in developing a cycle track between Barnageera and Balbriggan was further delayed by land acquisition/wayleave problems for part of the route. We understand that these issues have now been resolved and that a public consultation process is planned. Recurring bike thefts at Skerries Railway Station were a significant problem in 2013. SCI gathered data on the level of thefts and brought the problem to the attention of Irish Rail local media. We are grateful to local media for highlighting the problem and for the assistance given by former Councillor Ciarán Byrne who raised the issue with Irish Rail and at the Dublin Regional Authority. The installation of bike lockers at the station was announced some months ago. SCI made a submission to the NTA on the draft Cycle Network Plan for the Greater Dublin Area. The Plan sets out a ten year strategy for Counties Dublin, Kildare, Meath and Wicklow which is intended to help increase the cycle network. SCI has also organised three cycling events to celebrate Bike Week 2014 in Skerries: A Photo Cycle Safari on 15 June; Discover Your Bike on 21 June; and A Family Fun Cycle on 22 June. Tidy Towns: The people of Skerries once again did the town proud in 2013 by helping us to win the Gold, the county and regional awards in the National Tidy Towns Competition. This year we are slightly apprehensive as the goal posts have been changed. Our region has been greatly enlarged with many other winning towns now in the running for the regional award. In the past year we commissioned a Wildlife and Sustainable Management Enhancement report. We are working on the suggested actions therein. As part of the report we launched our Skerries Safari which can be followed through our new Facebook page or through the SCA website. As always, we ask for your help to care for Skerries.